Please ensure that you have created your staff members before creating staff shifts. Navigate to Bookings > Staff shifts. You will see that your staff members are on the right-hand side, ready to be added to the staff shift calendar. You can add staff shifts to the calendar by dragging and dropping a staff member anywhere on the calendar. 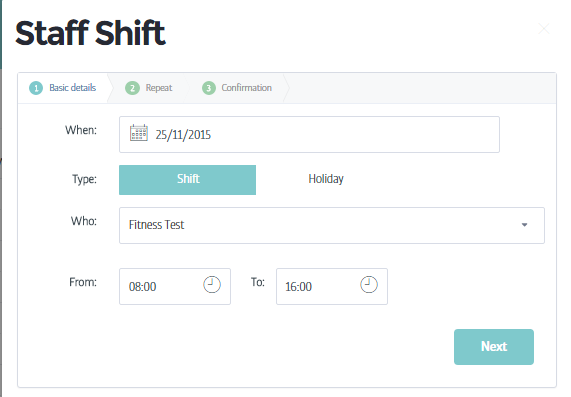 This will give you the option to edit the details of the shift (such as date, time, and member of staff assigned to the shift). Once you are happy with these details, click next. You then have the option to 'repeat' the staff shift. You can repeat daily, weekly, or monthly, up to a maximum of 50 sessions, or 6 months. You can also decide how often the shift will repeat. For example, if you selected it to repeat 'weekly', you can decide if this will be every 1, 2, or 3 weeks, etc. In addition, you can dictate on which days the shift runs. 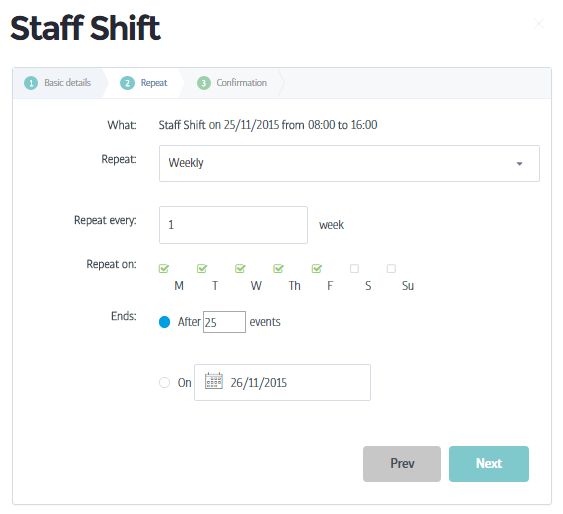 For example, if the staff shift is set to repeat weekly, you can set it to be weekly every Monday and Wednesday. You then need to select how long the shift is to repeat for, after a number of sessions, or for the repeats to end on a selected date. In addition to creating staff shifts this way, shifts are also created automatically when a booking is added to the bookings calendar and assigned to a staff member (see how to create bookings here). These shifts are created for the staff member assigned to the booking, and can be used as an alternative way to organise your staff shifts. Once the shifts have been created, you can click and drag staff shifts to edit their length and duration, but also drag across the calendar to change the date and time.